Annual (32), or perennial (67). 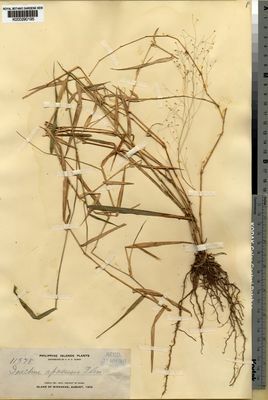 Rhizomes absent (92), or elongated (4). Stolons absent (94), or present (2). Culms erect (29/92), or geniculately ascending (32/92), or decumbent (30/92), or prostrate (15/92), or rambling (12/92), or leaning (1/92), or scandent (4/92); robust (2/16), or slender (11/16), or weak (3/16); 2-53.61-600 cm long; firm (88), or wiry (4), or woody (5); without nodal roots (2/35), or rooting from lower nodes (35/35). Culm-internodes terete (3/3). Culm-nodes swollen (1/1). Lateral branches lacking (4/30), or sparse (8/30), or ample (20/30), or fastigiate (1/30). Ligule an eciliate membrane (1), or a ciliate membrane (3), or a fringe of hairs (85), or absent (10). Leaf-blades linear (33), or lanceolate (74), or elliptic (8), or oblong (3), or ovate (17); membranous (2), or herbaceous (90), or coriaceous (4); stiff (15), or firm (80), or flaccid (1). Leaf-blade midrib indistinct (3/7), or evident (1/7), or conspicuous (3/7). Leaf-blade venation without cross veins (95), or with distinct cross veins (1). Leaf-blade margins unthickened (5/48), or cartilaginous (45/48). Leaf-blade apex muticous (95), or pungent (1). 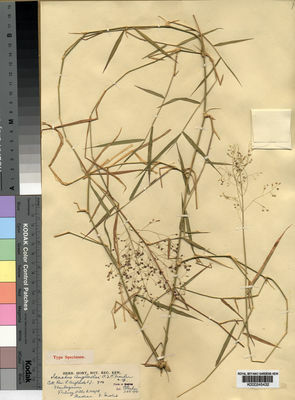 Inflorescence a panicle, or composed of racemes (1); terminal (95), or terminal and axillary (2); exserted (94), or embraced at base by subtending leaf (4). Panicle open (89), or contracted (7), or spiciform (1). 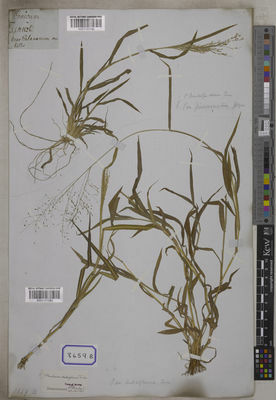 Racemes single (1/1); paucilateral (1/1); bearing few fertile spikelets (1/1). Spikelet packing lax (1/1). 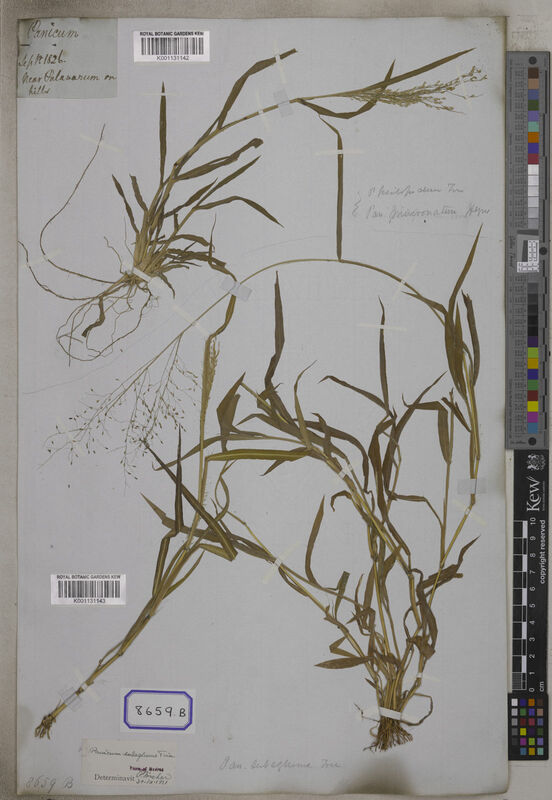 Spikelets appressed (1/2), or spreading (1/2); solitary (94), or in pairs (2). Fertile spikelets pedicelled. Pedicels filiform (24/27), or linear (1/27), or clavate (2/27); tip rectangular (1/4), or widened (3/4). Spikelets comprising 0 basal sterile florets (2/21), or 1 basal sterile florets (21/21); 1 fertile florets (26), or 2 fertile florets (73); without rhachilla extension. 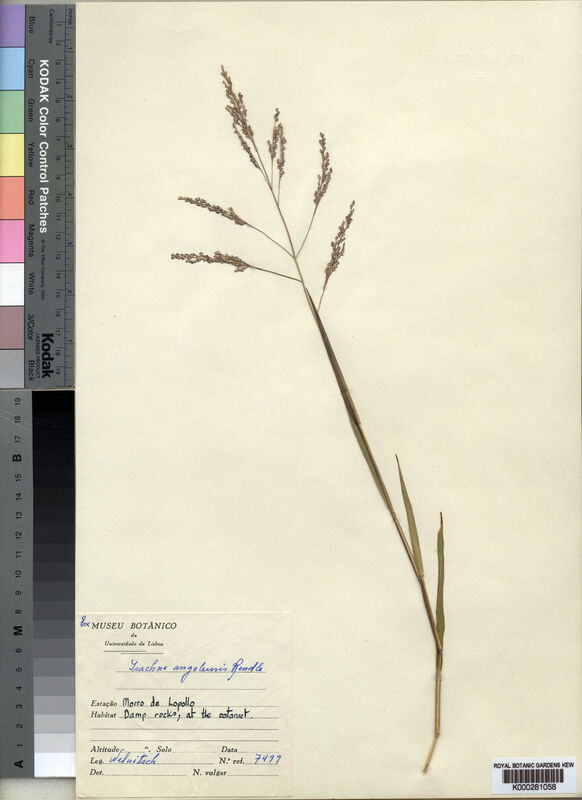 Spikelets lanceolate (1), or elliptic (23), or oblong (8), or ovate (14), or orbicular (50), or obovate (21); of unremarkable solid shape (95), or globose (1); subterete (1), or dorsally compressed (95); 0.5-1.923-4.5 mm long; breaking up at maturity; disarticulating below each fertile floret (76), or above glumes but not between florets (20). Rhachilla internodes brief up to lowest fertile floret (92), or elongated between glumes (2), or elongated below proximal fertile floret (2); suppressed between florets (10/74), or definite (64/74); glabrous (62/64), or pubescent (2/64). Floret callus woolly (2/2). 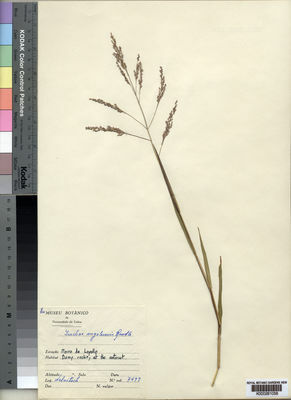 Glumes deciduous; shorter than spikelet (41), or reaching apex of florets (45), or exceeding apex of florets (15); thinner than fertile lemma; incurved at apex (1), or parallel to lemmas (93), or gaping (2). Lower glume lanceolate (9), or elliptic (19), or oblong (14), or ovate (54), or orbicular (14), or obovate (6); 0.8-0.9966-1.1 length of upper glume; membranous (90), or chartaceous (2), or herbaceous (4); without keels; 3 -veined (8/80), or 4 -veined (2/80), or 5 -veined (44/80), or 6 -veined (16/80), or 7 -veined (40/80), or 8 -veined (18/80), or 9 -veined (23/80), or 10-11 -veined (4/80). Lower glume lateral veins obscure (6), or distinct (90). Lower glume surface convex (95), or flat (1); smooth (89), or asperulous (5), or scabrous (4); glabrous (51), or puberulous (15), or pubescent (23), or pilose (4), or hirsute (1), or hispidulous (12), or hispid (5), or setose (3). Lower glume apex emarginate (1/95), or truncate (1/95), or obtuse (64/95), or acute (22/95), or acuminate (7/95), or cuspidate (5/95). 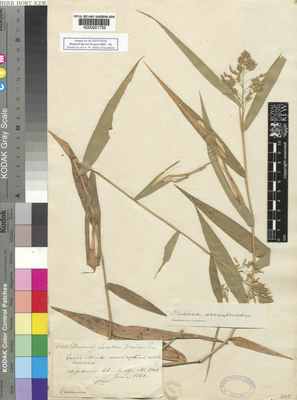 Upper glume lanceolate (8), or elliptic (19), or oblong (7), or ovate (56), or orbicular (15), or obovate (8); 1-1.117-2 length of adjacent fertile lemma; membranous (90), or chartaceous (2), or herbaceous (4); with undifferentiated margins (87), or hyaline margins (9); without keels; 3 -veined (3/75), or 4 -veined (2/75), or 5 -veined (39/75), or 6 -veined (18/75), or 7 -veined (43/75), or 8 -veined (17/75), or 9 -veined (26/75), or 10-11 -veined (7/75). Upper glume surface smooth (90), or asperulous (5), or scabrous (3); glabrous (49), or puberulous (17), or pubescent (19), or pilose (8), or hirsute (1), or hispidulous (11), or hispid (5), or setose (4); with simple hairs (57/65), or tubercle-based hairs (8/65). Upper glume apex emarginate (1/95), or truncate (2/95), or obtuse (65/95), or acute (22/95), or acuminate (4/95), or attenuate (1/95), or cuspidate (5/95), or caudate (1/95). Basal sterile florets male (24/24); with palea (22/22). Lemma of lower sterile floret elliptic (11/22), or oblong (6/22), or ovate (9/22); 1-1.37-1.7 length of fertile lemma; membranous (5/18), or chartaceous (7/18), or herbaceous (2/18), or cartilaginous (2/18), or coriaceous (3/18); 5 -veined (5/6), or 6 -veined (1/6), or 7 -veined (2/6), or 8-9 -veined (1/6); without grooves (25/26), or sulcate (1/26); obtuse (9/11), or acute (2/11). 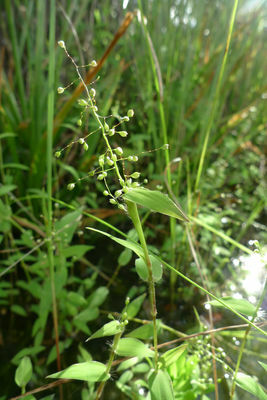 Fertile florets bisexual (90), or female (11). Fertile lemma lanceolate (1), or elliptic (32), or oblong (9), or ovate (30), or orbicular (41), or obovate (8); hemispherical (5/5); chartaceous (4), or cartilaginous (10), or coriaceous (77), or indurate (6); without keel; 0 -veined (1/14), or 5 -veined (12/14), or 6 -veined (9/14), or 7 -veined (10/14), or 8-9 -veined (1/14). Lemma lateral veins obscure (11/11). Lemma surface smooth (93), or scabrous (1), or papillose (1), or punctate (1); unwrinkled (95), or rugulose (1); glabrous (47), or puberulous (35), or pubescent (18), or pilose (1). Lemma margins involute; exposing palea (92), or interlocking with palea keels (4); eciliate (92), or ciliolate (1), or ciliate (1), or pubescent (3). Lemma apex obtuse (93), or acute (2), or acuminate (1); without ornament, or pubescent (1). Palea 1 length of lemma; membranous (1), or chartaceous (4), or cartilaginous (8), or coriaceous (78), or indurate (5); 0 -veined (1/78), or 2 -veined (77/78). Palea surface glabrous (87), or puberulous (5), or pubescent (4), or pilose (1). Lodicules 1 (1/7), or 2 (6/7); fleshy (4/4). Anthers 2 (1/80), or 3 (80/80). Caryopsis with adherent pericarp (78/78); ellipsoid (5/13), or oblong (1/13), or ovoid (4/13), or orbicular (3/13), or obovoid (1/13); laterally compressed (1/3), or dorsally compressed (2/3); plano-convex (3/3). Africa (14), or Temperate Asia (20), or Tropical Asia (59), or Australasia (4), or Pacific (9), or North America (3), or South America (12). Florets similar or dissimilar, separated by an abbreviated internode, the lower sometimes male. Glumes subequal, 3/4 to as long as spikelet, 5–9-nerved. Superior lemma crisply chartaceous to crustaceous. Inferior lemma membranous to coriaceous. Caryopsis ellipsoid to suborbicular, dorsally flattened on one side. Isachne comata Munro ex Hack. Isachne distichophylla Munro ex Hillebr. Isachne edamalayarensis Sunil, Naveen Kum. & Sivad. Isachne gossweileri Stapf & C.E.Hubb. Isachne guineensis Stapf & C.E.Hubb. Isachne henryi S.R.Sriniv. & Sreek. Isachne jayachandranii Gopalan & V.Chandras. Isachne kannurensis Sunil, Ratheesh, Sujana & Sreek. Isachne kunthiana (Wight & Arn. ex Steud.) Miq. Isachne soderstromii R.S.Rodrigues & Filg. Prodr. Fl. Nov. Holl. : 196 (1810).